What you see in the big-box stores is not the universe of shower wall panels. 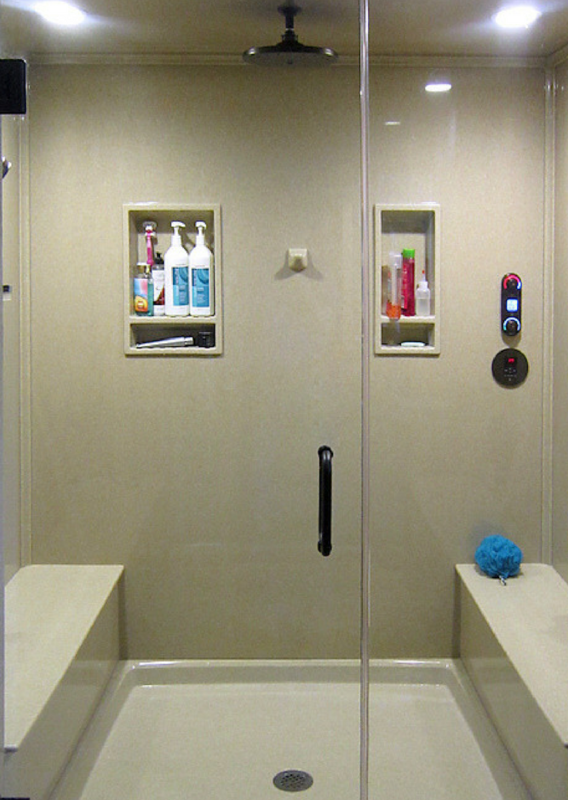 Before you decide on using panels check out the 3/8″ thick, durable solid surface shower surrounds. They have a lifetime guarantee and are built to last. As a matter of fact, I worked with a Maintenance Manager of a university in Virginia who used them in 33 men’s dorms rooms. Now – if you have any young men this age (I’ve got two aged 18 and 23) you know TLC, shower maintenance and these guys don’t go together. These panels are not cheap, but will hold up whether they are in your rental home or your boy’s bathroom. In most cases installing shower wall panels is not difficult and can be done by a DIY homeowner, handyman or professional contractor. In this project you’re making cuts into the panels for the shower valve and head and/or trimming to fit if your walls are out of square (yes – most of them are out of square). You’ll either be applying adhesive to the back and set the panels onto backer board or with the laminated wall system you simply screw them to the studs (with no backer board material). 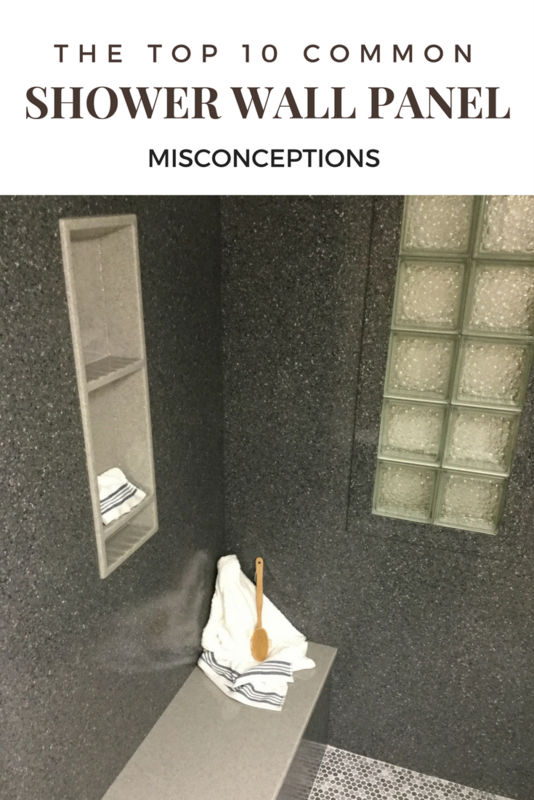 Misconception #3 – Shower wall panels only come in white and beige – BORING! 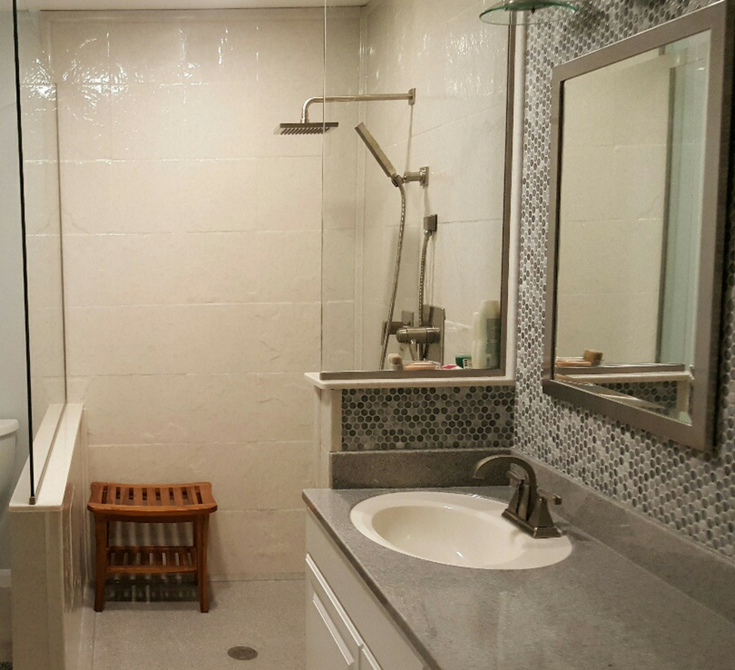 When you go to remodel your shower, your goal is to upgrade. You don’t want to put up with the dirty bottom fiberglass shower pan and walls the builder slapped in when the home was built. Boring white and beige surrounds are out of the question. 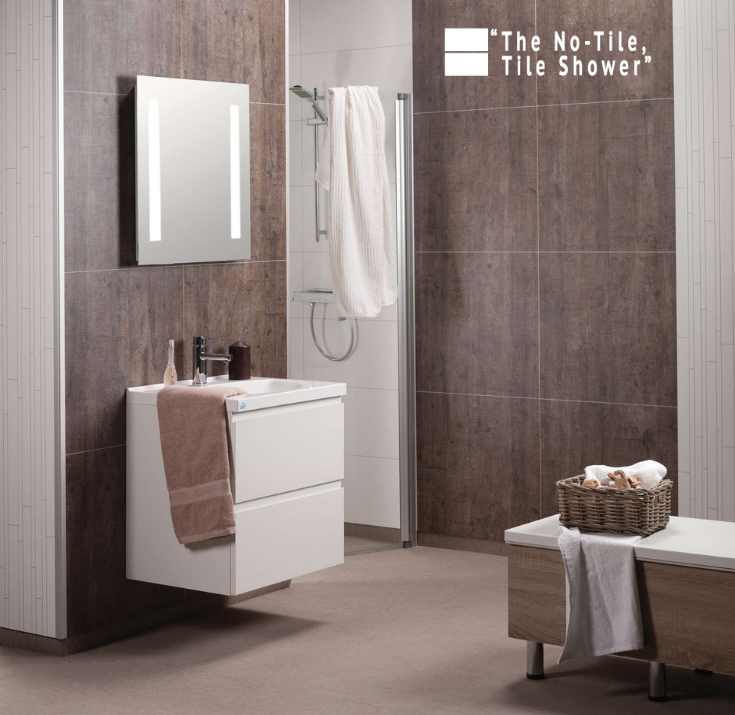 This is a big reason people choose tile. There are various colors and patterns to put style into your bathroom. 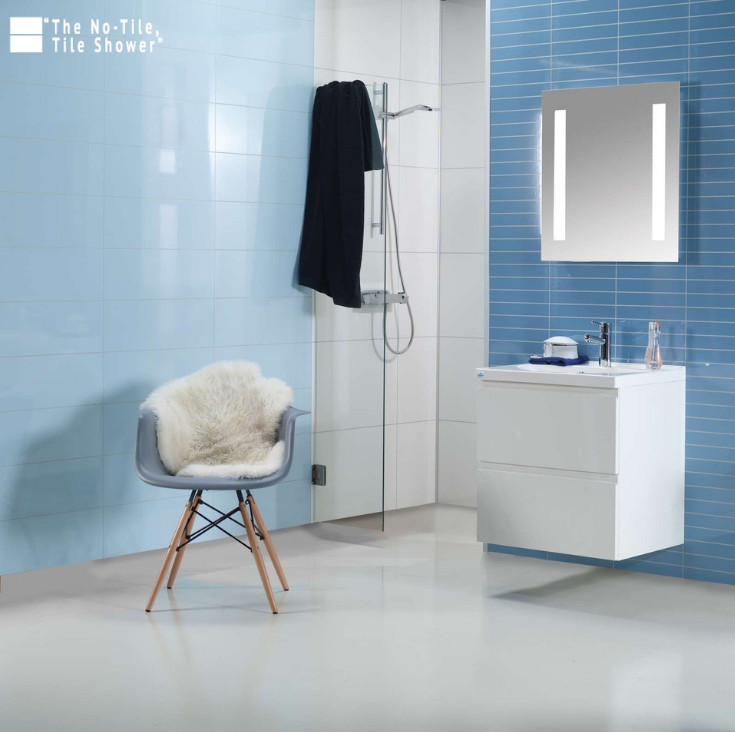 What’s nice is fashion and color are not mutually exclusive with shower wall panels. If you want color which pops and adds light which bounces off the surface you’ll want optical grade high gloss wall panels. Another option – with equally cool colors are the laminated panels. You’ll see a fun ‘blue sky’ pattern below. If you’re a fan of pattern (and low maintenance) these DIY friendly shower panels come in 20 different granite patterns – without the cost of granite or the maintenance. Put an end to boring. Put an end to maintenance. Choose these acrylic high gloss or laminated high gloss panels. Doesn’t your bathroom experience deserve some fun? I wish this was a true. 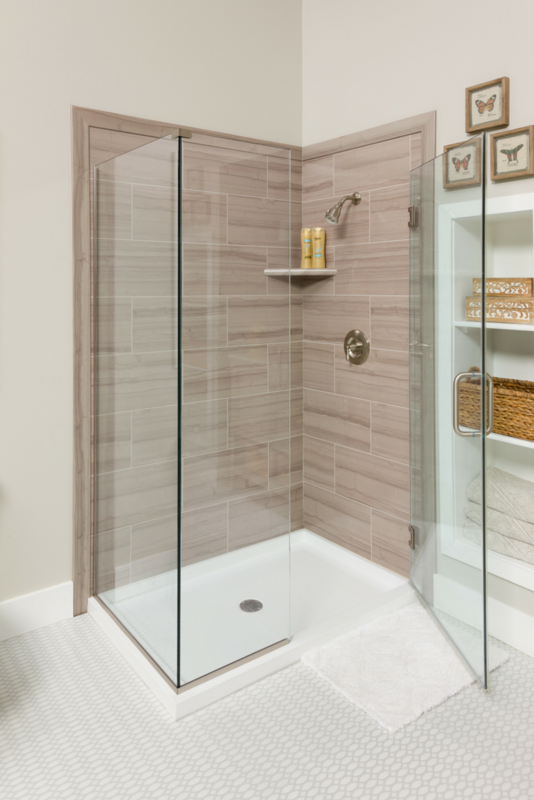 If you buy home center shower wall panels (think fiber reinforced plastic (FRP) or fiberglass) they will be cheaper than tile (but then again, they look the part). Let’s face it, these 2 types of panels will not get your bathroom in House Beautiful any time soon. For the better-looking shower wall panels if you use a decorative PVC composite faux stone wall panels (see below) and solid surface the pricing will be comparable to tile (especially if you’re looking to have your tile professionally installed). These are shower panels – not tile! There are some cool wall panels (like the high gloss ones mentioned above) which are more expensive than tile (but they add wow factor). This is true…and it’s not true. 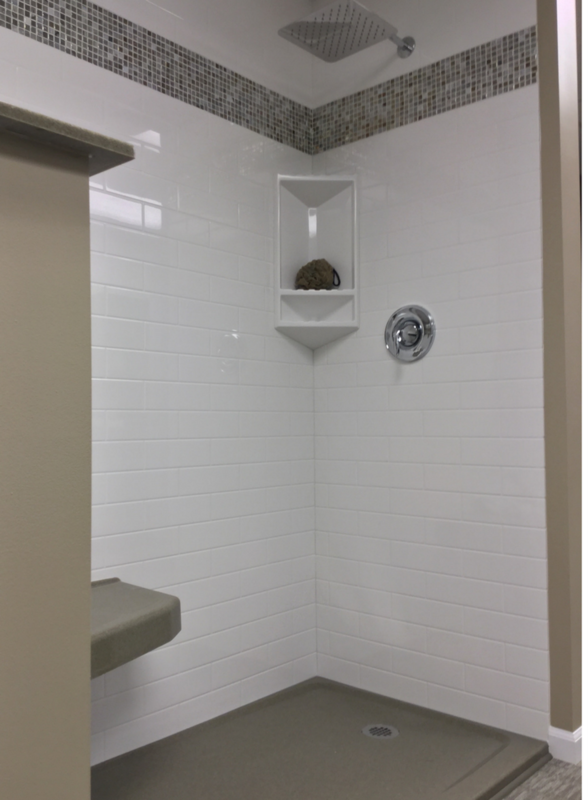 Most shower wall panels (including the PVC composite and cultured stone options (which are waterproof by design) are installed onto a moisture resistant backer board for support. The laminated wall panels are installed direct to the studs. Common woodworking equipment like circular saws, jig saws and hole saws will work fine. Depending on the type of wall panel you choose look at the manufacturer’s instructions before cutting or drilling for the best results. Often people with custom sized showers choose tile because they assume (incorrectly) this is their only option. 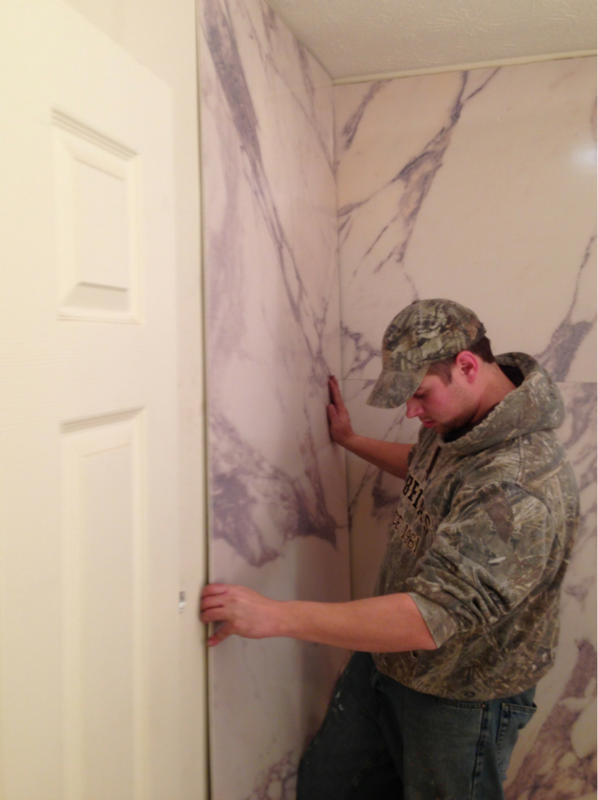 For example, solid surface shower wall panels can be pre-cut to the exact size of your walls – saving you time and pulling all of your tools out. Other panels (like high gloss and the decorative faux stone panels) are simple to take standard sizes and cut to fit odd sized or shaped walls, vaulted ceiling or angled corners. 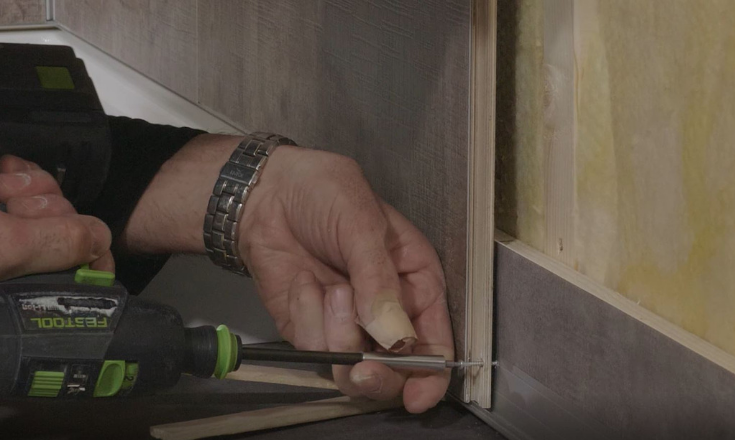 The laminate wall panels also use a simple tongue and groove system where you can cut the last panel in the wall to fit any sized shower. While it’s nice to have thicker panels – the most important thing in showers where the people using them won’t treat them well (can you say boy’s bathrooms, rental homes, hotels and motels) is to choose a panel system where the color or pattern is not only “skin deep.” In this situation even if there is a slight scratch you won’t notice it because the color is throughout the panel. Solid surface is a good choice in these cases because the color is throughout the 3/8″ thickness of the pane. I agree with you, working with cement board (which is heavy, cumbersome and not easy to cut) is not pleasant. However, with grout free panels since the wall units are waterproof you only need to use moisture resistant green board behind them. This will save you time and aggravation vs. cement board (which is usually used for tile jobs). The nice thing about remodeling is if you (or the original builder or previous owners) didn’t get it right the first time – you can make it right this time. Not running the wall panels to the ceiling (especially in an 8′ high ceiling) is not a good idea IMHO (in my humble opinion). Why have your shower head stick out of a drywall wall? Why repaint the top of your shower if you don’t have to? If your budget permits, run panels to the ceiling. Value your time enough to blow up the need for future maintenance. Here’s 2 examples where cultured granite shower wall panels and the laminated shower wall panels were run to the ceiling. It looks better and save you the aggravation of needing to repaint down the road. As they (whoever “they” are) say, don’t be fooled by cheap imitations (bad substandard wall panels) or bad information. 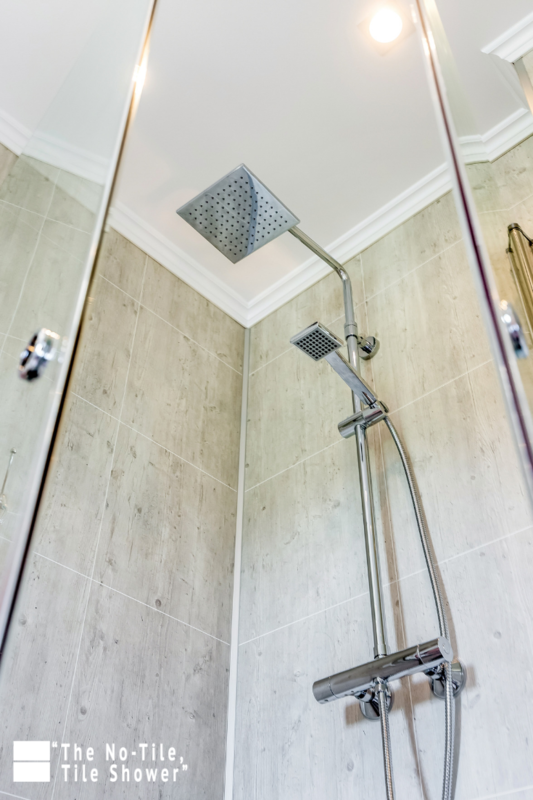 Before you remodel your shower take time to research the best options for you. Seek out articles on the Internet, on Pinterest or talk to contractors and friends (who know what they are talking about). Seek out experts who work with these panels day in and day out before accepting you have to use tile or cheap standard fiberglass tub/shower units you see in your local home center store. If you’re looking on input or high-quality choices in grout free shower wall panels on a nationwide basis call Innovate Building Solutions at 877-668-5888. 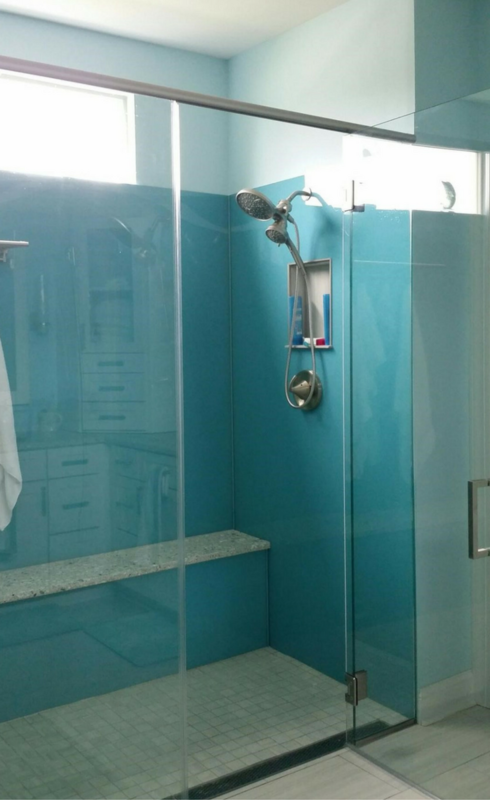 For a local bathroom remodeling project check out Cleveland Design and Remodeling (216-658-1290) of The Bath Doctor in Columbus Ohio (614-252-3242). We live on the west coast and are looking at Utile shower wall panels, Kohler Choreograph, and others. My question is I read some pretty scary reviews regarding Utile shower panels and glass doors on http://www.consumeraffairs.com. But there aren’t a lot of reviews out there. Perhaps the bad reviews don’t really reflect the reality for most buyers? Can you provide any insights into the Utile, or the Kohler system for that matter, from the standpoint of quality, safety, value/prices, etc?